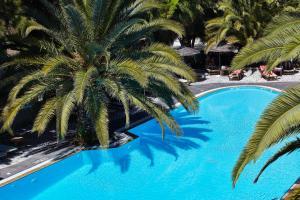 The Meltemi Village Hotel enjoys a great location, just 350 meters from the black sand beach of Perissa, and right in the center of the main activities in the area. 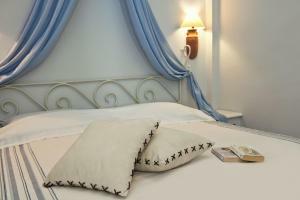 This room has the typical Cycladic style and features satellite TV, a small fridge and a private balcony. 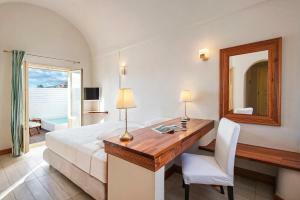 This room has a typical Cycladic style and features a kitchenette, satellite TV and a private balcony. Suite with a spacious living room and a balcony or terrace with a private spa bath. Junior suite with a safe and a balcony or terrace with a private spa bath. 2 Suite levels with balcony or terrace with private hot tub. This villa is located at 400 meters from the main building. 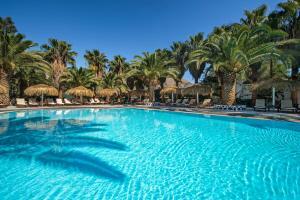 Guests of the villa can use Meltemi Village's pool, which includes sun beds and umbrellas, depending on availability. 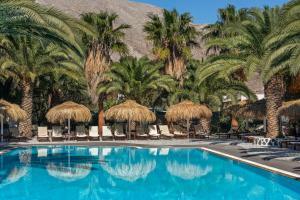 Free sun beds and umbrellas are also available on the beach, located in front of the villa, subject to availability. A nearby water park can be accessed free of charge from June to September.